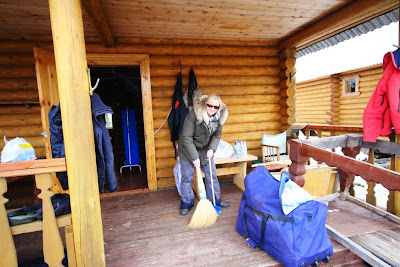 We had a domestic day here at Varzuga and are settling into our camp routine. We have had a really busy and constructive 24 hours setting up both the Middle and Lower camps. Terry and Donna went back up to Middle Camp with two boats loaded with supplies; here at Lower Camp Glenn, Bill and Ollie Maxwell (the Kitza camp manger) got on with giving our boats and engines a really good service. We had towed Skylark back down here on Wednesday, the big boat from Middle who after many years of loyal service had an engine issue late last season, and she now has been given a well deserved re-fit and is ready to go back up this afternoon. Tiffy and Maryke got on with sorting out the advance order of food supplies which arrived in the village by truck yesterday. 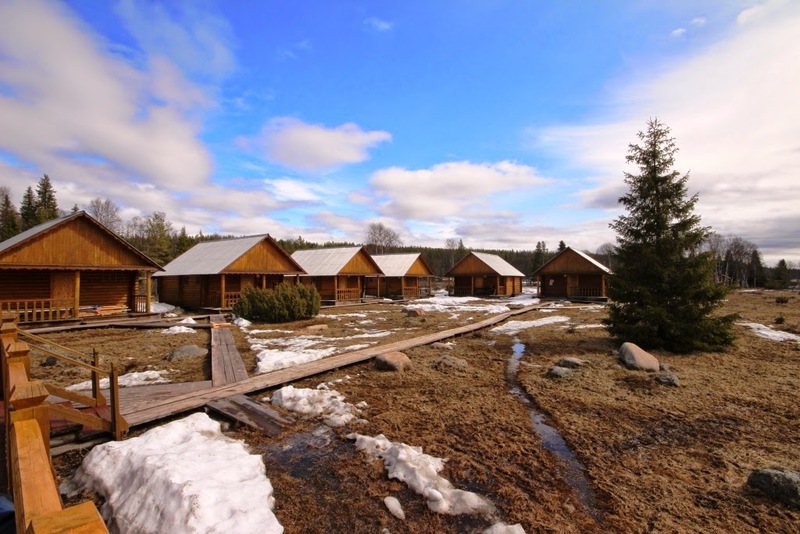 It is now all ready to go out to the camps today and finally the main lodge sitting and dining rooms can be tidied up ready to greet our first guests tomorrow. Our helicopter arrived last night and in an hour or so I will return with it to Murmansk – inevitably the girls have given me a shopping list - and so has Glenn – so I guess I face another happy afternoon in Murmansk chasing down the last pots of curry paste (and fresh herbs!) for Donna and Maryke and some more spark plugs and spanners for Glenn. The river too is settling in – good news – I suspect that the big spring flood is just starting to drop off. Bill reckons the river is down a centimetre or two this morning and it is looking much clearer. It will be pretty high when we start fishing on Saturday evening, but within a day or so it should now drop back to a much more manageable height. The salmon will be here, Terry is very enthusiastic about the prospects at Middle, a high river but little or no ice left and yesterday evening Generator looked really inviting. 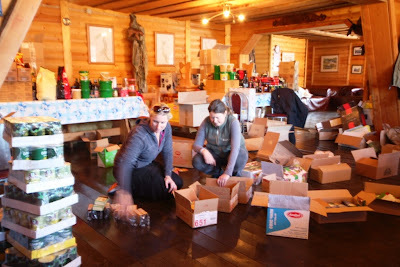 Maryke and Tiffy sorting supplies - the dining room will be clear by tomorrow! At Lower we will have fewer options until the river drops a foot or so, but there is more than enough room for our 10 rods – I’m pretty confident that by Sunday morning we will have a much more benign and accommodating river. I fly to Murmansk shortly and the next blog will be on Sunday morning and I look forward to updating you then. Yesterday, Wednesday, we had the weather we really did not want. Rain. We have a lot of snow this year in the watershed and, ideally, we’d hope that it melted slowly over the next few weeks. Nothing shifts snow faster than rain and by mid-day it was overcast and damp with steady rain right through to the late evening. The river is now really high, pushing through the withy bushes in Heli Pool at Lower Camp. The forecast looks a little cooler and with little or no rain for the next few days, so the river should settle down by the weekend. 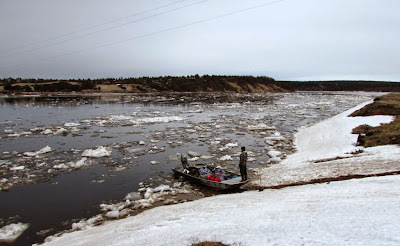 In any event next week we are going to be fishing a high, cold river - true Varzuga spring conditions and although not an ideal height we will find the fish. We will not have all the beats in play at this height, but the salmon will be tucked into ‘laybys’; I chatted with head guide Feodor this morning and he felt that Heli Pool, Bear Corner, Janaways and Sviats should all produce fish. When the river comes off a couple of feet we will have much more room. Terry, Donna and I went up to Middle Camp and met the team up there who were opening the camp up and getting the boats in the water. 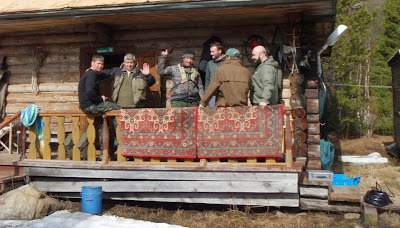 The camp looks in good shape, Misha has made a new table for the extended veranda, quite a bit of woodwork has been painted and Donna has made new curtains for the Main Lodge. 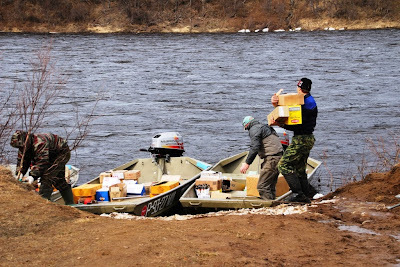 We have the same guiding team too and they seem to be itching to get going on the river. At Middle we ran up the river as far as Beach and the banks look clear of ice – at this height of water almost all the ice is washed out and some spots looked pretty fishy. Peartiha, Snake Pit, Lower Bear, Fortress and of course Generator all looked good. Today Terry and Donna will run back up to Middle and will continue opening up. Sasha and I go shortly to the village where more supplies have arrived. It is all coming together quite well at the moment. Our helicopter is due to arrive this eveing and we can start moving more supplies and kit about. Next week we go over to Kitza - Ura reports a high river over there, but a good clean out of the ice. We are getting a really good wash out of the winter ice this year. It was a mild day yesterday with some rain and drizzle in the afternoon. 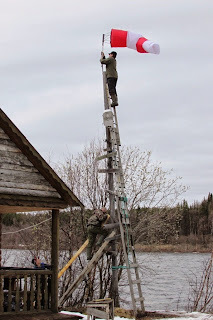 It did not freeze overnight and the river was still slowly rising in the evening, so before we turned in for the night we hauled the boats up as far as we could and made them fast to a strong silver birch. This morning the river can be called ‘high’. Under a mild, grey sky the snow is slushy and disappearing fast. To put it all into perspective - the river is a foot or so lower than the big river we had in May last year and now running much clearer. Ice is still coming down, but there is much less of it – the river is cleaning out pretty fast. Each year the melt is different. So far it seems a ‘normal’ ice melt and there is a tangible relief amongst all of us that we have had no ice blockage on the river or any flood in the camps; you really do not know just what dice nature will throw – so far it seems a throw in our favour. Yesterday the ice continued to come down, sometimes the river was clear for a few minutes then we would get some really quite big stuff passing silently by. Big Misha, the Middle Camp manger, told us to wait it out until today and looking at the river this morning we should probably be able to get through to the island camp. So I hope to get some photos for you from Middle and get them on the blog tomorrow. 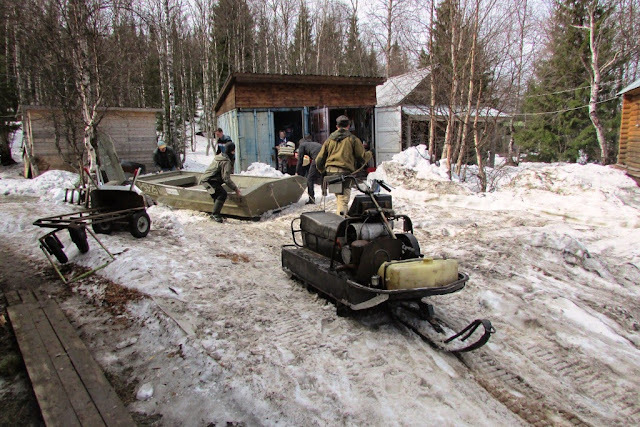 There were gaps in the ice flow coming down yesterday and a run up the village seemed OK so the Girls Team went up to see Marina in the store while the Boys Team remained in camp and got on with sorting the boats and engines out. We now have five more boats parked on the slush and brown grass ready to go into the river. The Girls Team came back with welcome supplies and there is now a large pile of bags all tagged up and ready to go out to the various camps as soon as we can get going on the river. I have no ‘hero shot ‘ with a salmon in hand for the blog today; we have not had a cast yet although a couple of rods have been put up and sit waiting on our office veranda. There is some itching amongst us to have a cast but actually no one is any rush, we have a full season to come – just give the river a couple of days to settle in and then the fishing can commence. 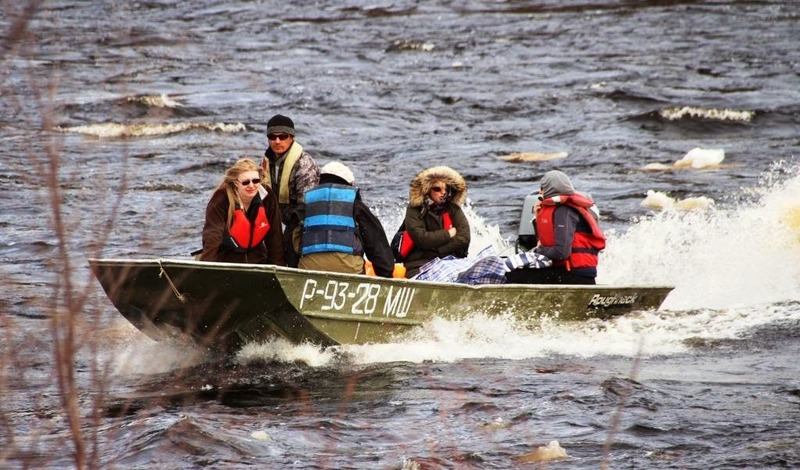 If you are coming out on 16 May expect a high, cold river. Proper spring conditions. A selection of sinking tips will be useful and my guess is that a largish fly, say 1 ½" to 2 ", fly will do the trick. More tomorrow and hopefully a picture or two from Middle Camp. 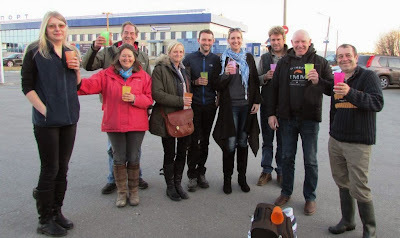 I met the advance party at Murmansk airport on Sunday evening and after the time honoured reunion celebration with Russian champagne in plastic pic-nic mugs in a bright but windy car park we set off for Varzuga. 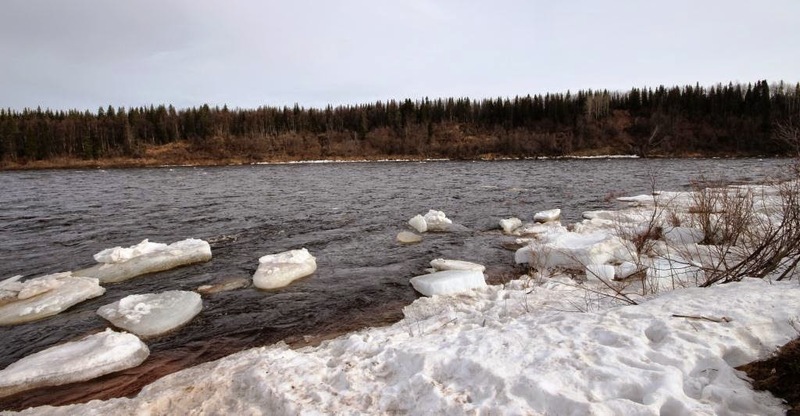 Arriving at midday on Monday we found the river unfrozen and flowing freely, albeit with plenty of ice coming down. We had had reports over the weekend that the ice was breaking and as always it was a great relief to come over the hill into sight of the village and to see, in the distance, a long dark ribbon of open water rather than a frozen, white landscape. Feodor and the team of guides had two boats in the river but getting to camp by boat took a bit of time as we waited for patches of clear water between massive rafts of ice. 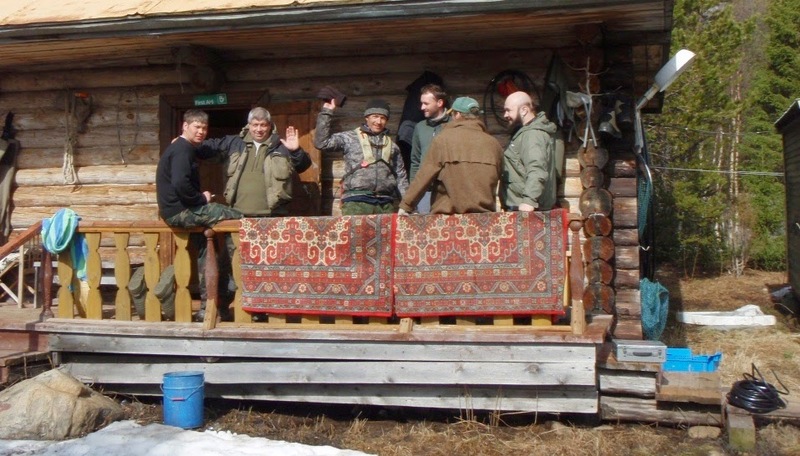 By mid-afternoon we were all installed with our kit in the familiar and warm surroundings of the Lower Camp – Sobacci as it is known by the locals. The weather is pretty mild for the time of year; overnight we had a light frost and this morning the air temperature is a balmy 8⁰C with little or no wind. The river came up about 8 inches yesterday and has settled overnight – it is high, and for us that is just perfect as there is a steady stream of ice coming down and we are getting a really good clear out which I hope will leave few of the precarious ice walls on the banks of favourite pools that dog us some years. If the normal pattern prevails the river will stay high for a day or two yet and then slowly settle in and the fun can commence. 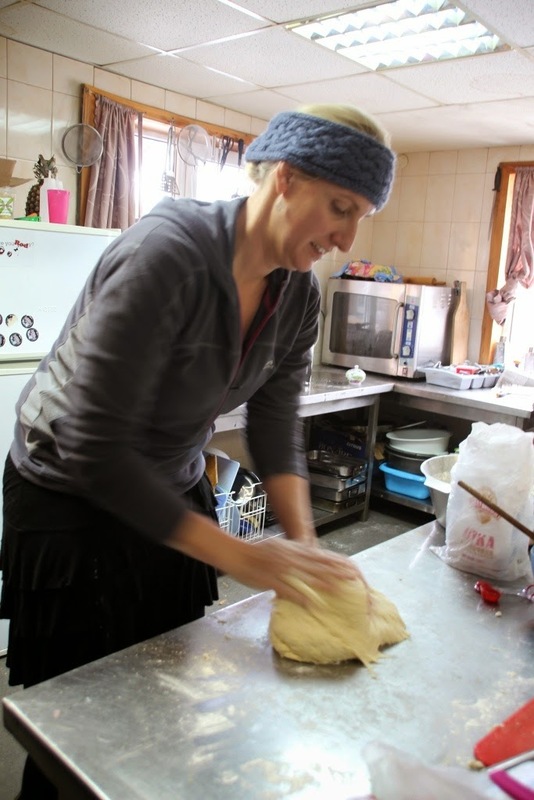 Today we will get up to see Marina who looks after the vast store in the village where our supplies are kept – and, if the ice flows diminish, this afternoon we will take a boat up to Middle Camp to see how that looks. 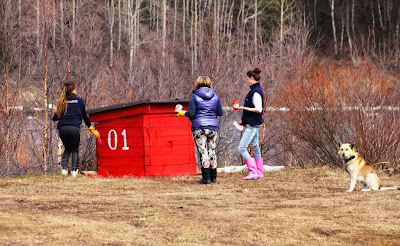 In the meantime there is masses to do here and the camp is a hive of activity; the rest of the boats are being dragged to the river, and the lodge being prepared for our first guests who arrive on Saturday. ‘So far so good’ as they say – I look forward to updating you tomorrow.